« What’s Your Favorite Season? The farmers took a trip to Colfax last Saturday and picked up our pork bounty. We now have lots of pork chops, bacon, ham steaks, and ground sausage. Of course we have hams and roasts too. We’ll be at the Farm to Fork Market at Normandy Farms, Friday, October 11, 4:00 p.m. to 7:00 p.m. (79th Street and Marsh Road). Betsy’s Kitchen will be offering gluten-free pumpkin pie bars and flour-less chocolate cake. 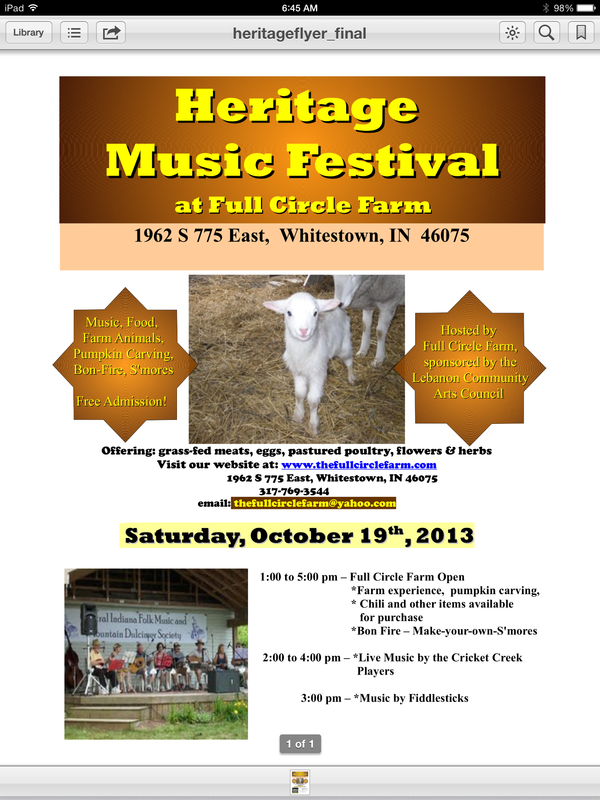 Don’t forget our Heritage Music Festival on Saturday, October 19. It’s sponsored by the Lebanon Community Arts Council and will feature music by the Cricket Creek Players and Boone County’s own Fiddlesticks. Check out the flyer.